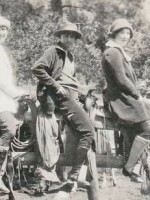 Rocky Mountain National Park was just over 10 years old that rainy summer when a young woman from Fayette, Iowa, newly graduated from college with a degree in speech and English and a thirst for adventure, traveled across the country by train to work as a dining room girl at the Horseshoe Inn. This was the heyday of the romantic and majestic Horseshoe Inn, a rustic but genteel lodge situated in a grand meadow framed by towering peaks. Five years later, in 1931, the Horseshoe Inn was the first of the park’s lodges to disappear in the effort to bring the park back to its natural state. Eleanor Parker wrote home almost every day, and her mother carefully transcribed her daughter’s letters into a school composition book that was passed down through her family and recently discovered. Her letters are the basis of this lively account of the young adventurer’s first summer away from home, a summer filled with hikes, moonlight horseback rides, dancing in the casinos, and sight-seeing automobile drives. Includes historic photographs and maps of her hikes and rides, many to the long-gone historic park lodges and all to landmarks and sights familiar to today’s park visitors. This is a very good letter writing day, cool and rainy. I’m sitting in the dining room writing. It’s cozy and warm in here and a little too cold in the cabin. It really is a pretty dining room. I think there is a picture of it in the folder. They have it decorated with aspen leaves, gold and red. It must be wonderful here in the fall. Yesterday we started to walk to the fish hatchery again and Mrs. Rushton, the one who rode to town with us Tuesday, came along and picked us up. She is so nice to us and treats us as tho we were guests— rather than dining room girls. She has two darling children whom she has adopted and a nurse to take care of them. They are staying all summer. She is quite a musician and plays the piano beautifully and is an all around good sport. Everyone likes her. We had a wonderful hike up to Chasm Falls. As we were going up the road we met some people who were trying to find the falls, so they went along with us. Ruth thot [sic] she knew a short cut from the road to the one above, so we started up and kept going and going. Ruth finally let me hike the lead because it was hard picking a way. The rocks were so steep and slick. I went ahead, scrambling over the rocks and edging along as best I could. Finally I looked back to see if the others were coming and far below me I saw the four switchbacks and the falls. Ruth had started off the road too far down, and we had missed all four switchbacks. The road goes like this up the mountain. The turns are called switchbacks. I’m sure there’s a picture of these switchbacks in the bunch of pictures I sent you. It certainly was thrilling. About the first real mountain climbing we’ve done, but it’s really not wise to get off a trail. Ruth was pretty well scared in several places, and I had to help her across. The people—a man and his wife— were very nice to us. It was terrible hard on her as she had skirts on, but they didn’t go up as high as we did. There was one place as we were coming down that even the man was afraid to attempt, but I got across all right, then held my foot for the others to step on. This book is a gem. 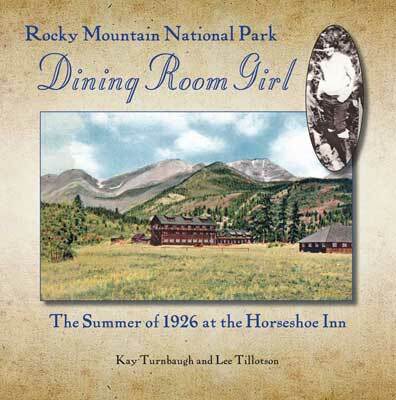 Using newly-discovered material, readers see Rocky Mountain National Park and the long-gone Horseshoe Inn through the eyes of an adventurous girl from Iowa.